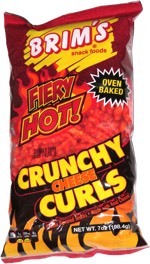 Taste test: A very good, thick crinkle cut chip. 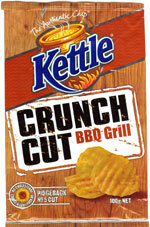 I am a fan of the original style Kettle Chips, and these manage to keep the same potato flavor base. However, I don't feel the BBQ Grill flavor does it justice. Yes, it is enjoyable, but the flavour is just too strong and I became bored before I was halfway through the pack ... and that doesn't happen often! Smell test: Strong BBQ smell.